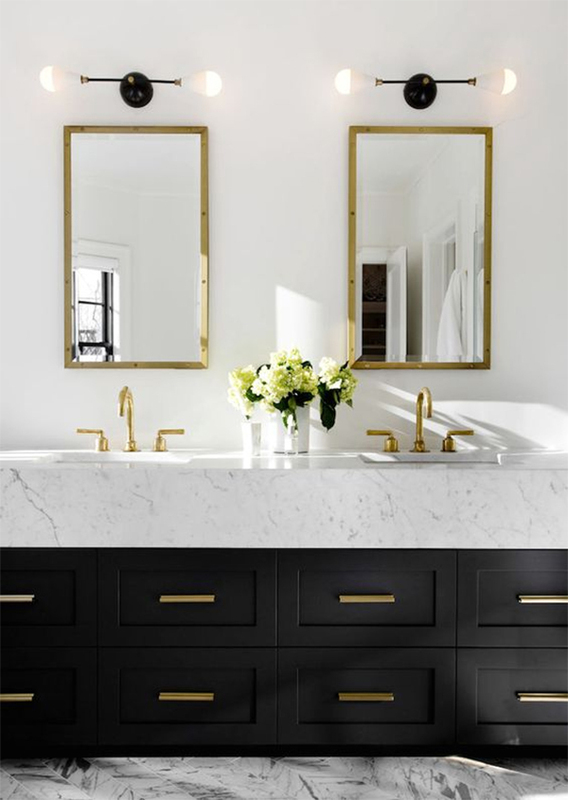 If you struggle to keep your bathroom shiny and spotless, you’re not alone. Next to the kitchen it is the most used room in the house, which can make it hard to keep everything neat and clean. From toothpaste stains and soap scum to hair products all over the counters, there is always work to be done. 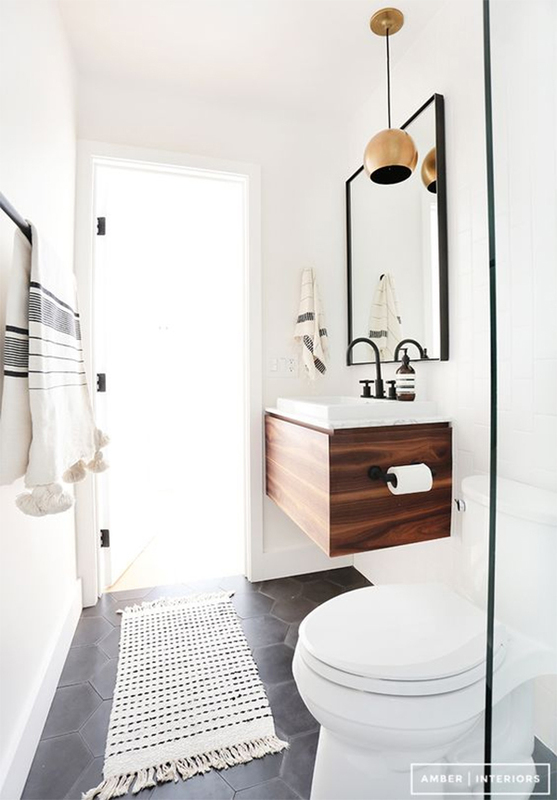 And while I don’t have a way for your bathroom to magically clean itself, I do have something just as good: Proven Tricks and Tips to Organize and Clean Your Bathroom. With use of these proven cleaning methods, I’ll help you make your bathroom tidy and pristine. Because if the place you go to get clean isn’t clean, then what’s the point? 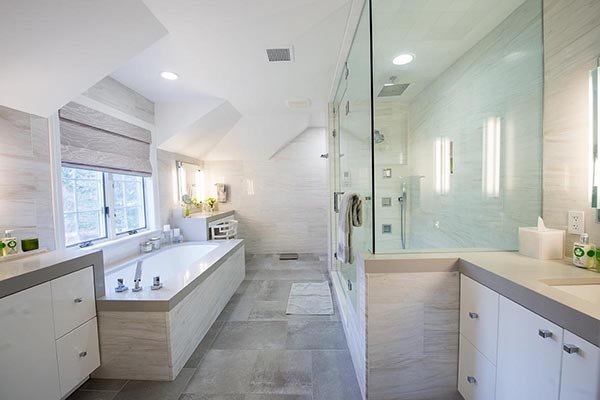 A dirty bathroom is not only unsanitary, but unsightly. Who wants to wash in a room where there are soap rings around the toilet or grout that looks gray? To combat these common stains and achieve floors that are clean enough to eat off of (not really, but you get the point) we found simple, effective mixtures that will get the job done. Read on and find out the answers to your most stubborn cleaning problems. It makes sense that toilets, the place where we empty out tummies, are one of the hardest to clean parts of the bathroom. Plus, standing water can cause lime build-up and mineral deposits, making it hard to keep fresh. Luckily, there is an easy way to keep it clean, and it’s using household baking soda. For daily cleaning: pour a cup of baking soda into your toilet, let sit for 5-10 minutes, then brush gently around the sides using a soft-bristle brush and flush. You can also use this solution on the outside of the toilet and the seat, using a rag to wipe and rinse. For built-up stains and caked-on grime: use the same amount, but allow it to soak longer and use a damp pumice stone to scrub clean. Pumice stones work well without scratching the toilet surface. Tiles can be a pain to keep clean, as every splatter and fingerprint tends to show. A quick, efficient way to clean them involves just 3 basic items (a rag, bathroom cleaner and your shower), but done in a different and more efficient way. 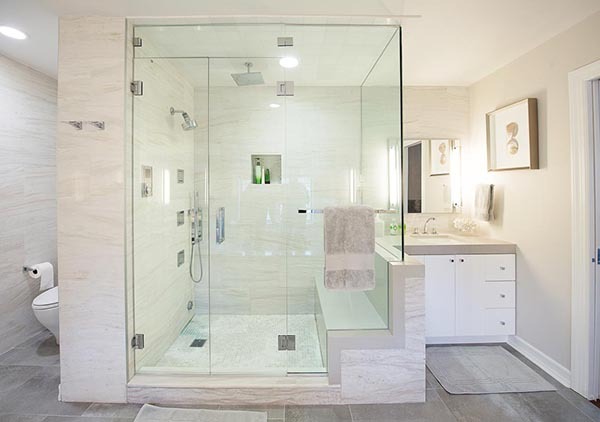 Simply spray the walls and ceiling with a basic bathroom cleaner, then run a hot shower and let the room steam up. Close the door, keeping the steam in for about 20 minutes, then go back and wipe down the walls and ceiling with a rag. The steam loosens and moistens the tiles, allowing for a much deeper clean with minimal effort. 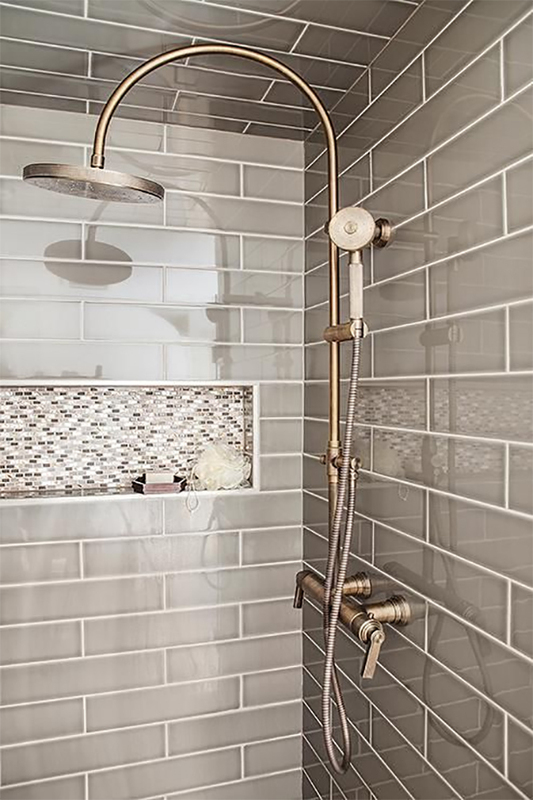 While the trick above works great for shower walls, it won’t do much for your shower head, tub, or doors, which are breeding grounds for bacteria. To get your shower head clean, fill a Ziploc bag with white vinegar, then submerge the head in it, securing it with a rubber band. Leave it to soak overnight, then rinse with warm water. This can be done weekly for a deep cleaning. For shower doors, make a paste, using a few drops of distilled white vinegar and baking soda, then apply to the door. The paste should be thick so it sticks to the door. Let sit for an hour, then rub it off using a microfiber cloth. Rinse with water and dry. 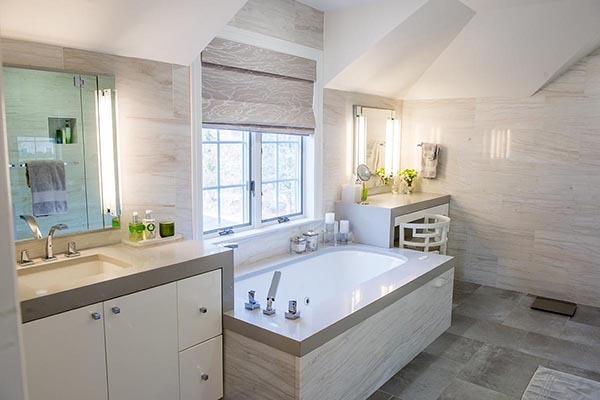 Bathtub’s can be an annoyance to keep clean since they are used so frequently. An easy solution is to mix pack of baking soda with vinegar to lightly scrub the tub with, then rinse with warm water. This solution is also very effective for removing stains from grout. Cleaning grout is tedious but necessary. To get it white and looking new, dip a toothbrush or brush in bleach and rub over it. Rinse after with water to prevent yellowing. The previous baking soda and vinegar solution is also great for grout. 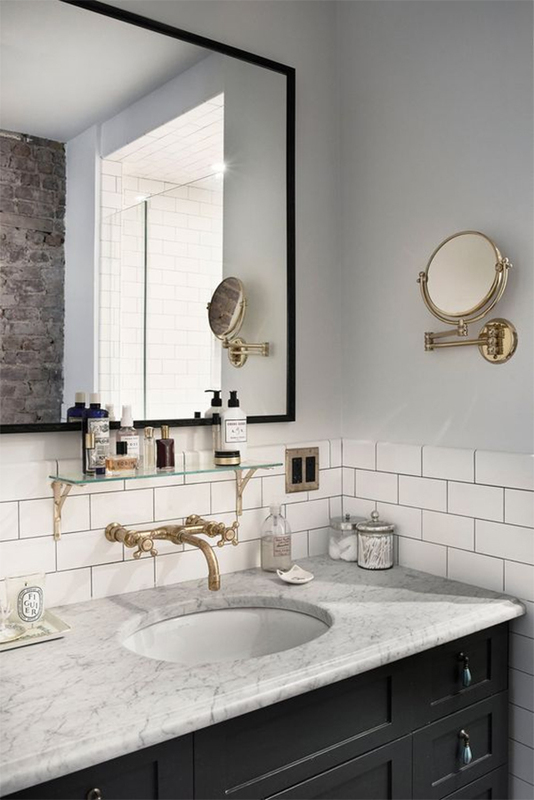 Sinks are one of the most used areas, so keeping them clean is essential. To keep the faucet and water knobs sparkling and germ-free, use disposable cleaning wipes regularly if you’re on the go. Especially since soap and water alone will not kill all the germs. Wiping down your sink daily will really go a long way. For the drain, pour white vinegar down the drain and flush with hot water to keep bad odors away. Once you try these easy cleaning techniques you’ll find that you have more time to enjoy your house- and the people in it. And once your bathroom and home are cleaned to perfection, you’ll also have more time for the luxuries of life… like enjoying a spa day at home. Cheers to a life that’s not only cleaner, but more relaxing!